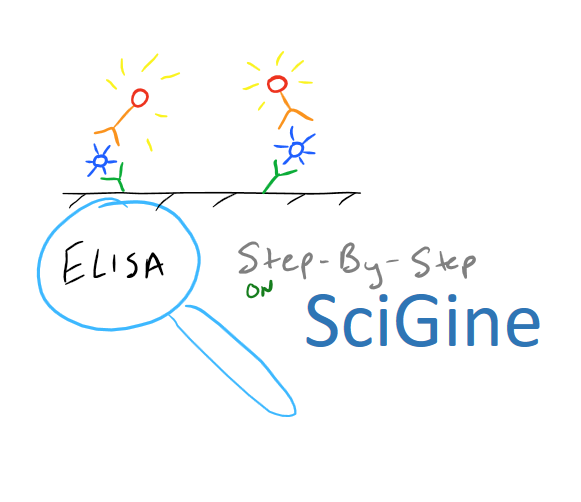 There are a few different types of ELISA assays but they all follow the basic strategy outlined above. Essentially, one can choose how to immobilize the antigen on the surface and how the antigen is detected via the antibody. 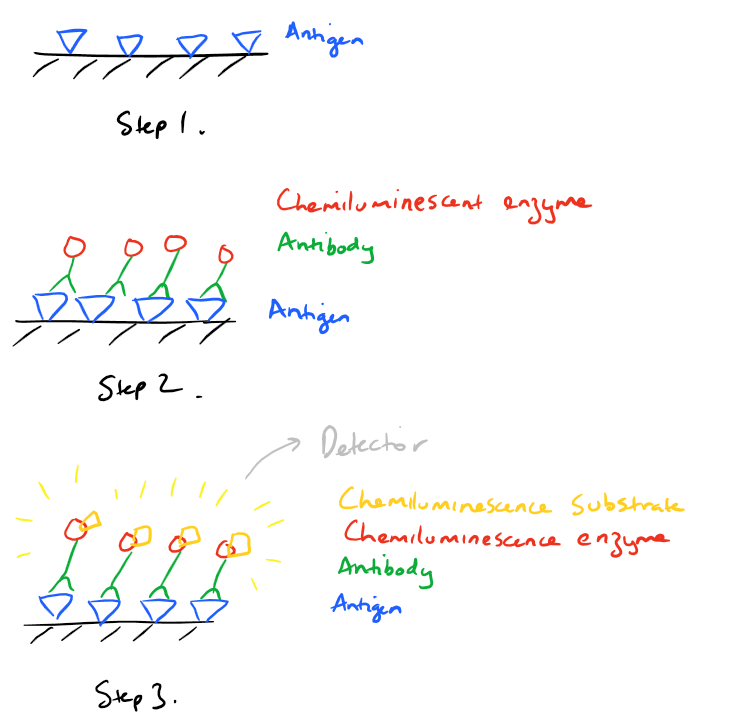 Indirect Assay: In this method, the detecting antibody doesn’t have the chemiluminescent enzyme. So, another antibody must bind to the first antibody to facilitate detection. Sandwich Assay: The most common type of ELISA. In this assay, a “capture” antibody is first immobilized to the substrate. Then antigen is flowed over it so that it gets immobilized to the surface along with the capture antibody. Finally the detection antibody is flowed over the substrate and it binds the antigen. 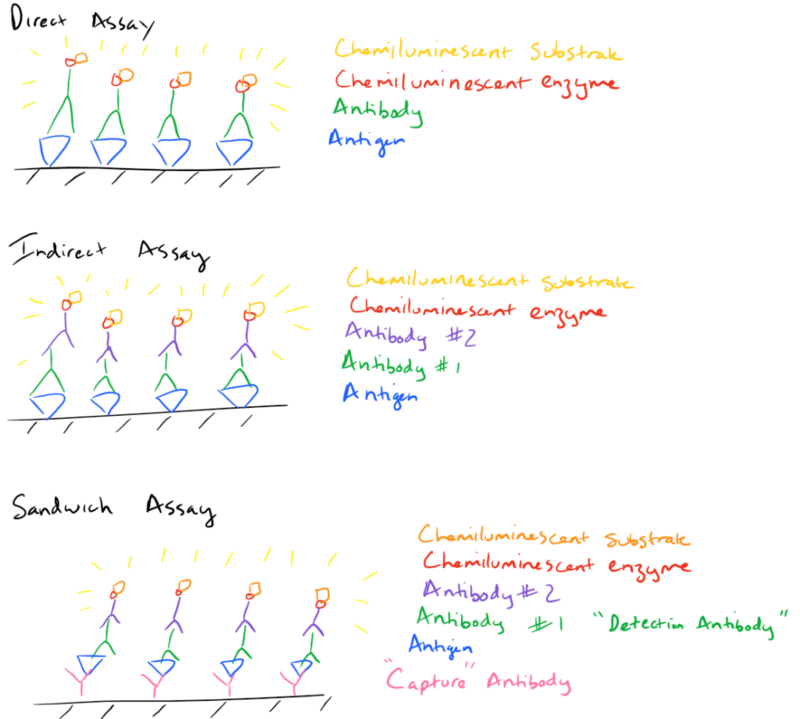 This detection antibody may be directly conjugated to the chemiluminescent enzyme (just like a direct assay) or another antibody may be needed (just like the indirect assay). TMB (3,3′,5,5′-tetramethylbenzidine). 1 mg/ml. Usually commercially available as a solution. Remove the solution from each well and add in wash buffer (200 ul per well). Shake for 5 minutes. Repeat 3-5 times. Add 200 ul of blocking buffer per well, cover and incubate at room temperature for 1 hour (or overnight at 4 oC). Add 100 ul of the Detection Antibody per well. Incubate at room temperature for 1 hour. Add 100 ul of the Enzyme conjugated Antibody to each well and incubate for 1 hour at r.t.
Repeat Step 4 to wash the plate (2 times). We need to make sure the plate is very clean and any non-specific binding is minimized. Add 100 ul of Stop Buffer. This should make the solution yellow. Measure using a plate reader at 450 nm absorbance. Note 1. Your standard curve needs to span beyond your antigen concentration because you need to determine the exact amount of your antigen within the linear range of the standard curve. If necessary, dilute your antigen solution down to a point where it is within your standard range. Note 2. Concentration of antibodies used will need to be optimized. It is highly likely that you will need to dilute each of the antibodies down rather than increase their concentration because these are at the upper ranges of the necessary concentration.